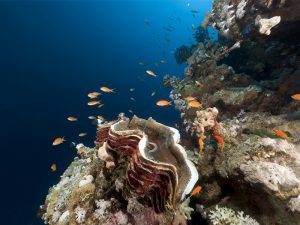 Each of Taveuni’s numerous dive sites delivers a unique experience exploring multicolored reefs and stunning varieties of marine life. Choose from the Rainbow Reef: The Great White Wall, Annie’s Bommie, The Ledge, Yellow Grotto, The Purple Wall, The Zoo, The Fish Factory—and more—for an unforgettable encounter of a lifetime. Get up close to manta rays, barracudas, white tip sharks, large groupers, sea turtles, moray eels, long nose hawk fish, leopard sharks—and more. Choose a challenging dive or a more relaxing dive. 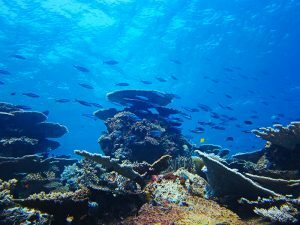 Our partner, the premier dive operator in Taveuni, caters to all levels of experience and only uses the latest dive equipment and the services of friendly and highly-trained PADI instructors. Take a trip to the Bouma National Heritage Park, just a 30-minute drive from the villa. 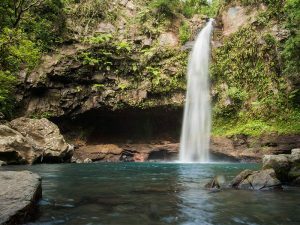 This important nature reserve in the northeast of the island offers a beautiful rainforest where you can walk to the three incredible Tavaro falls of Bouma. 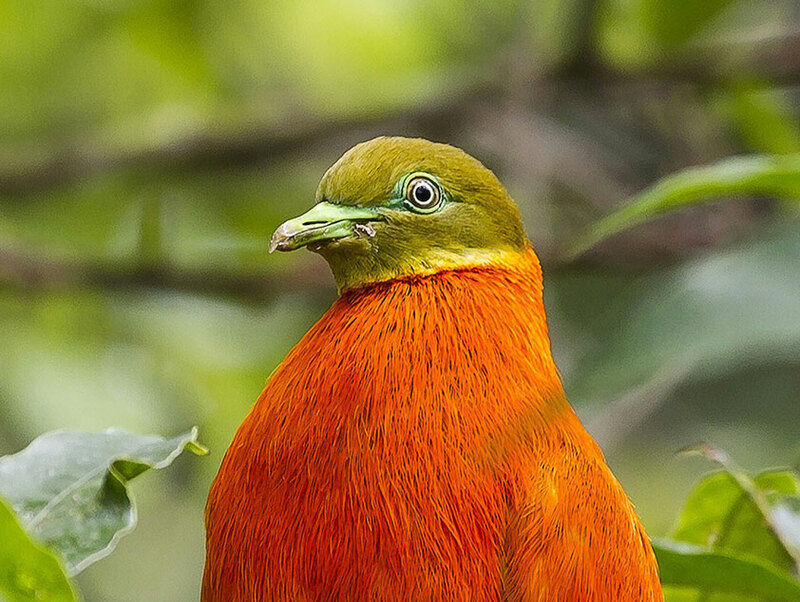 Thrill to the sights and sounds of rare tropical birds as you make your way through the exotic plant life. It’s just a ten minute walk that doesn’t require much effort to reach the first waterfall. 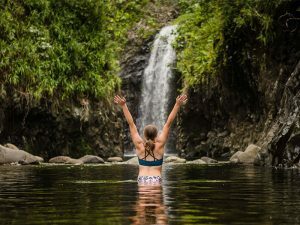 Reaching the second waterfall is a little demanding, but is rewarded with fabulous views and the opportunity to swim and picnic along the way. The upper waterfall necessitates a further thirty to forty minutes hike, but leaves no-one disappointed. 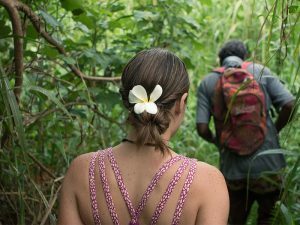 You can’t leave Taveuni without making your way to Lavena, the furthest point you can venture on the eastern side of the island. You can walk in and out or take our advice and kayak (or take a boat) there and walk back for a truly memorable day out. Your walk begins on a white sandy beach with rock pools. 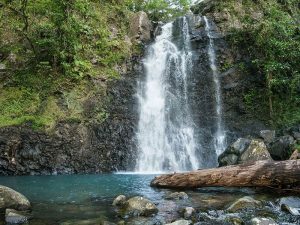 You ford rivers, cross a suspension bridge, marvel at the rushing waterfalls and pass Naba village, still inhabited by descendents of “blackbirded” Solomon Islanders. The prize at the end is a glorious waterfall and water slide. The walk is about ninety minutes each way. 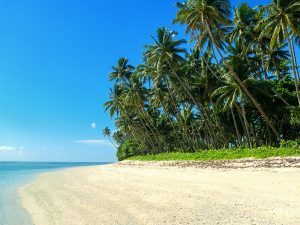 There are few land masses in the world that are crossed by the International Date Line—the 180 degree Meridian Line—and Taveuni is one of them. So it’s safe to say that each new day starts here. Mark the occasion by a visit to this famous landmark at an elevated viewpoint at Waiyevo. Photo opportunity! 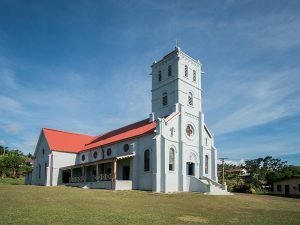 Just a kilometer away is the picturesque Catholic mission—a large stone church with stained glass and acclaimed sculptures making it the most architecturally interesting building on the island. You won’t see any pews, though. The congregation sits on the floor Fijian-style. Visit on a Sunday to hear singing that will live in your mind forever. 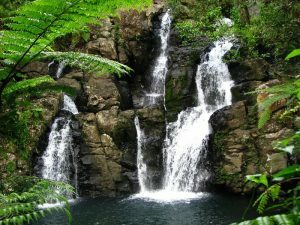 Another of the island’s striking natural beauties and a lot of fun especially after heavy rains. Set in the midst of beautiful tropical foliage. 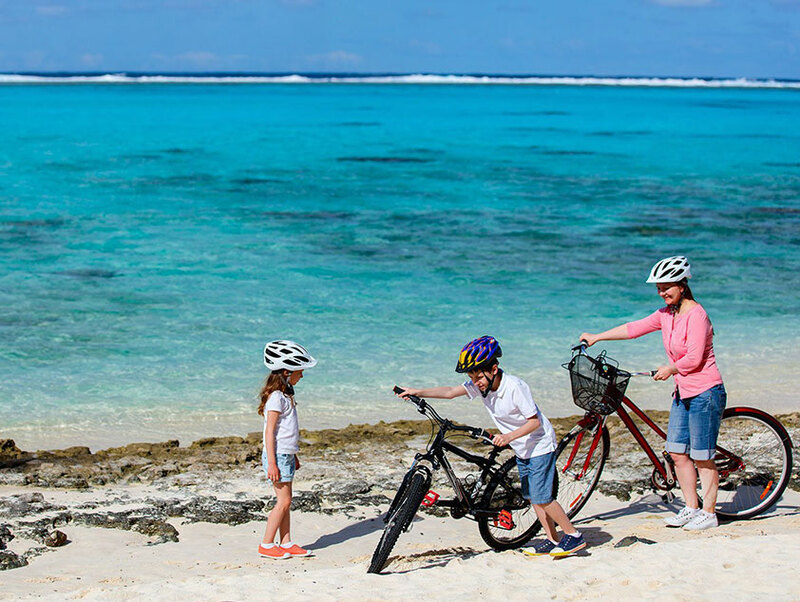 Try to visit on the weekends or during school holidays when the local kids can show you how it’s done. If you’re feeling fit and up for a full-day excursion put the Vidawa Forest Walk on your ‘must-do’ list. Taking an experienced and knowledgeable guide you’ll start with a scenic drive to Vidawa village before embarking on a rigorous hike that’s suitable for regular walkers and not the faint of heart. 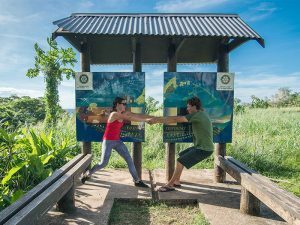 Along the trail you’ll see the sites of historic fortified villages, enjoy spectacular views of the coast and outer islands, and get an education about the abundant flora and fauna. 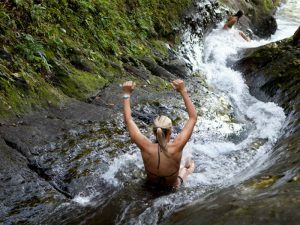 Your reward at the end is a refreshing swim in the waters of the Bouma Falls. 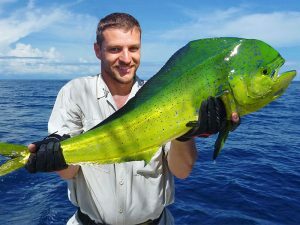 Within five minutes of setting out into the Somosomo Straights your exciting day of fishing begins. 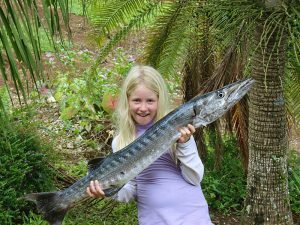 Under the expert guidance of our experienced captains you’ll enjoy an action packed day. 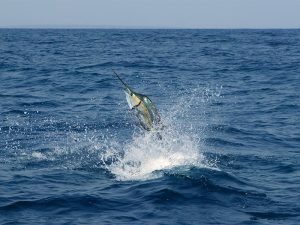 Depending on the time of year and your preference you may well catch Black Marlin, Blue Marlin, Sailfish, Wahoo, Mahi-mahi, and Yellow Fin Tuna. 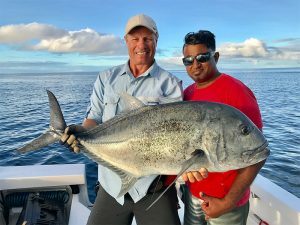 Reef fisherman can cast for Giant Trevally, Blue Fin Trevally, Barracuda, Walu, Dogtooth Tuna and more. 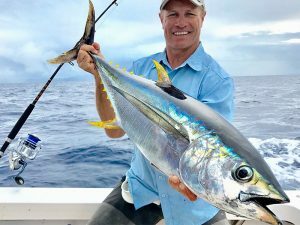 Our fishing guides know-how and passion make us the perfect choice for the serious coastal fisherman. 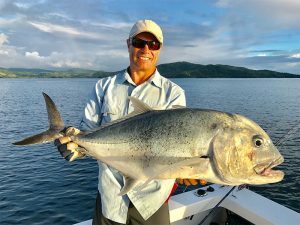 Most tropical game fish species are caught here year round however some have peak seasons when they are caught far more frequently. 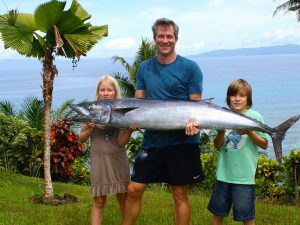 Email us and we will be happy to send you our Fiji species and seasons chart. Recognized all over the world for their specific natural colors, Fijian pearls are the most sought after pearls in the world. You want black pearls? 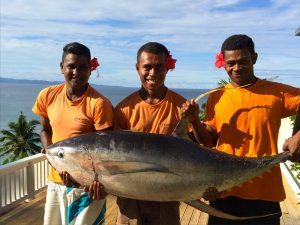 We’ve got them on Taveuni. But, also, there are pearls in amazing colors of gold, blue, green, pink, champagne, blue, chocolate and cranberry that are unique to the CIVA Pearl Farm in the Wailoa Lagoon. Let us organize a visit to the pearl farm where you’ll see the nursery where the mature oysters are harvested and a guide will explain the whole process. 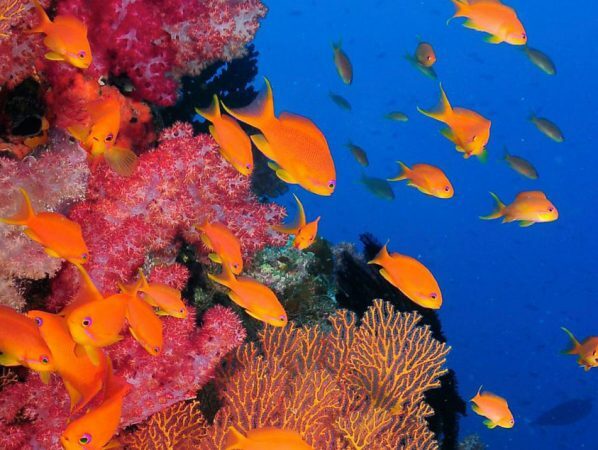 The Rainbow reef is the soft coral capital of the world. 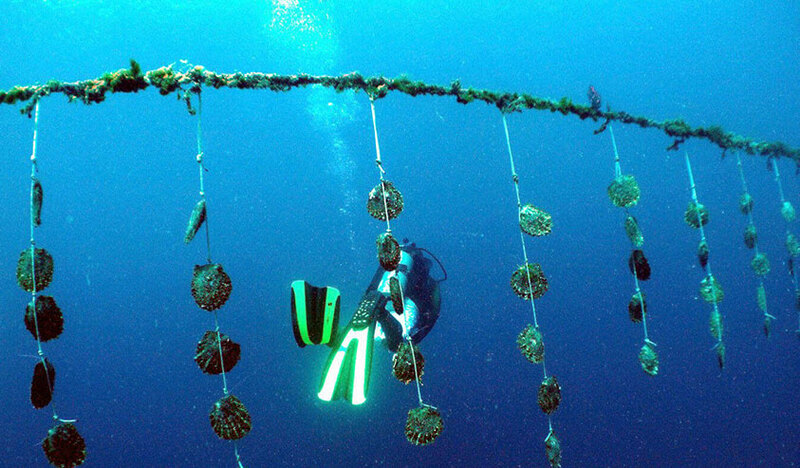 We can organize a first class snorkeling excursion to the reef which is a short 15 min boat ride from the coast. Its a must see experience. Awarded the “International British Airways Eco-Tourism Award”—for good reason. The Waitabu Villagers provide an extremely warm welcome beginning with morning tea and a fascinating cultural experience of Fijian village life. Your visit includes a trip up the river on a traditional bamboo “Bilibili” raft, snorkeling in the marine reserve, kava ceremony, local island dance and song. The villagers are rightly proud of the heritage they have worked so hard to preserve and share, and you are asked to participate by dressing modestly and covering your legs. While in the village it is also a sign of respect to remove your hat and sunglasses. There’s not much traffic on Taveuni so you’re not fighting for the road with automobiles. But there’s not much paved road either—except for the Matei to Somosomo road. The coastal road is hillier than you might think. 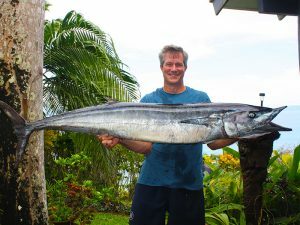 As you pass by you can expect the friendly locals to call out “bula” in greeting. A great place to bike. Did we mention the stars? 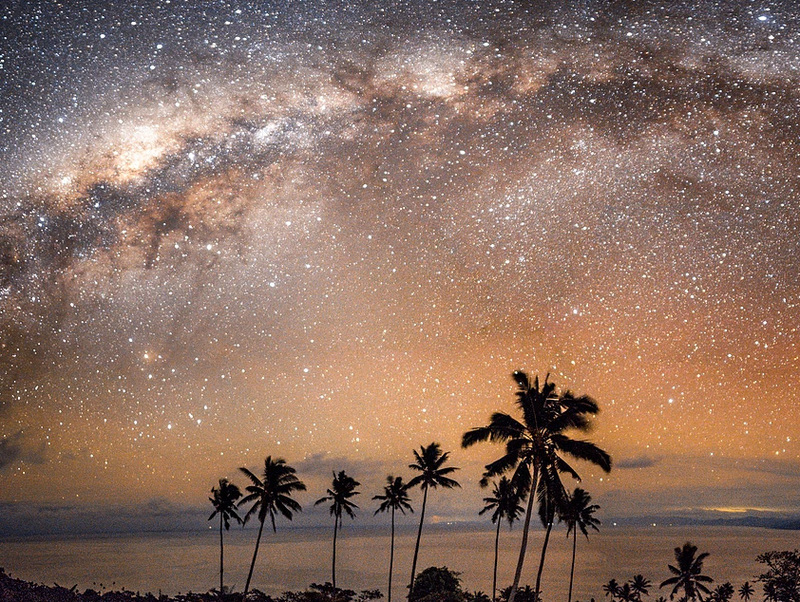 The night sky here is unbelievable. Just imagine…you’re on the 180th parallel in the southern Pacific Ocean. Far from so-called civilization. There is no city light pollution. Just you, serenely staring upwards marveling at the brightness of the twinkling stars…relaxing in our special built-in stargazing recliners and counting the shooting stars. It’s just heaven!